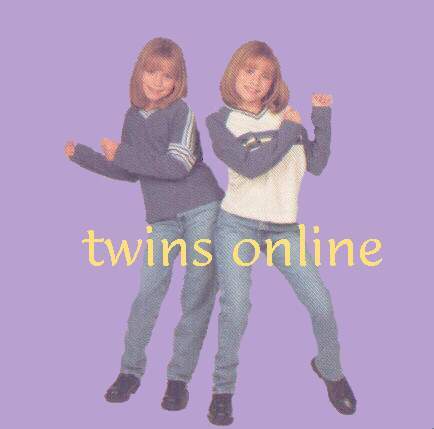 Welcome to Twins Online 1999. This page is about the Olsen Twins, Mary-Kate and Ashley and the things they have done and accomplished. These teen celebrities started thier career at 9 months, and now at 13 years old they have thier own "Twindom". These girls have shined in my life since they were saying the cutsie phrases on Full House and they're still shining as they say the witty phrases on Two of a Kind. I hope that if you are at this page you are also a fan of these girls and I hope you will remain one for years to come! If anyone is interested in being Sister Sites with us, just email us. We still have plenty of room left!